Last year, I told a story about how I once made a flourless chocolate cake FOUR years ago for Branden’s birthday but then lost the recipe for said cake during some moves. Each year, I thought I found the recipe again, but it was never quite right. Well my friends, I’m happy to say that four years and three flourless chocolate cakes later, I finally found the original recipe and its just as good as I remembered. This cake is incredibly dense but its so chocolately and moist – it goes excellent with some fresh berries and homemade whipped cream. Okay that’s all great and stuff, but I have to be honest…this cake is a complete pain in the rear to make – its so finicky and if you don’t follow the directions completely, it won’t turn out. Forgot to temper the eggs? You’re toast. Didn’t achieve stiff peaks in your egg whites and struggle to fold them in to the chocolate? Toast again. Seriously, this thing is a pain and I whine each time I make it about how much I hate it and then I take a bite and then I’m swept into euphoria and amnesia. This cake is heaven and worth ever bit of anger that I put into it! Preheat the oven to 350 degrees. Butter a 9″ springform pan. Put the chocolate and butter into the top of a double boiler and heat over (but not touching) about 1 inch of simmering water until melted. Meanwhile, which the egg yolks with the sugar in a mixing bowl until light yellow in color. Whisk in a little of the chocolate mixture into the egg yolk mixture to temper the eggs – this will keep the eggs from scrambling from the heat of the chocolate; then whisk in the rest of the chocolate mixture. Beat the egg whites in a mixing bowl until stiff peaks form and fold into the chocolate mixture. Pour into the prepared pan and bake until the cake is set, the top starts to crack and a toothpick inserted into the cake comes out with moist crumbs clinging to it, 20-25 minutes. Let stand 10 minutes, then unmold. Serve at room temperature with fresh whipped cream and berries. that certainly looks chocolatey and decadent! 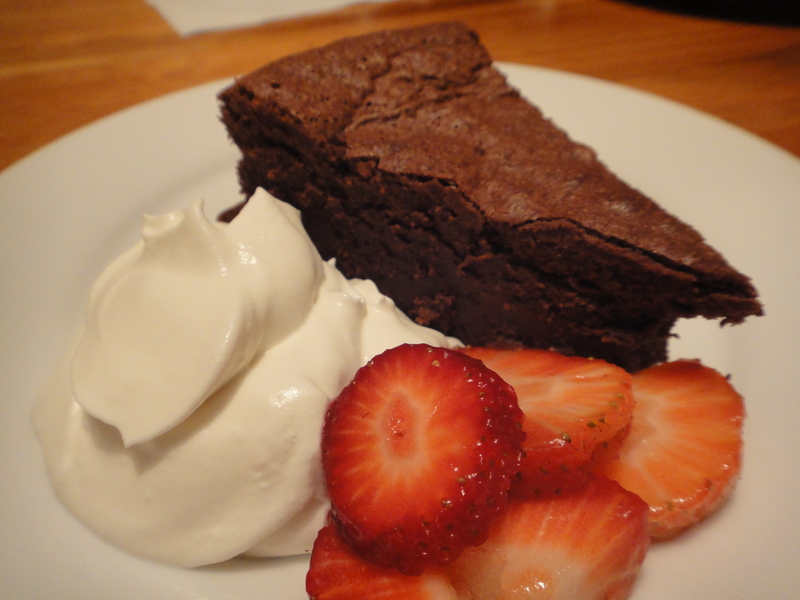 Looks so delicious – I adore gluten free chocolate cake, it’s so much better than average chocolate cake. Delicious. Flourless chocolate cakes are awesome. This looks great! I don’t know how I accidentally tripped across your site but I love, love, love it … I have subscribed to your blog feed & I’m nominating you for MY Food Stories Award for Excellence in Storytelling. I know some bloggers don’t participate in blog awards but I hope you’ll at least check it out because mine is unique in the fact that it is only is given to food sites and all the nominees are in the running for the monthly award and prize. If you’re interested, you can check out the details at my site … http://foodstoriesblog.com/food-stories-award/ … Either way, love your site and I hope you’re having a great foodie day!